This second edition provides a comprehensive view of consolidated and innovative concepts, in terms of both diagnosis and treatment. Written by leading international physicians and investigators, this book emphasizes the necessity of combining local and systemic treatments to achieve the objective of yielding higher cure rates and lower toxicities. Heavily updated from the previous edition, it highlights new surgery and radiotherapy techniques, disease awareness, patient quality of life, and comprehensive management. Head-and-neck cancers are a complex clinical entity and their response to treatment is also known to vary markedly in function of host-related factors. Notwithstanding the impressive progresses observed in the field of imaging, head and neck cancers are often diagnosed at a late stage and the presence of locally advanced disease in a significant number of patients implies the use of aggressive treatments in order to both ensure local disease control and reduce distant metastasis risks. 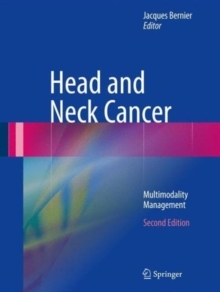 In comparison with the first edition, Head and Neck Cancer, Second Edition provides a detailed update of innovative concepts in chemo- and bio-radiation, viral infection impact on tumor growth and response to treatment, and impact of tumor- and host-related factors on treatment outcome.